8mm Trillion Color Change Fluorite and White Zircon Ring in 10K Yellow Gold. The Flourite is approx. 1.8-2.0 carats with 1.23cts White Zircon carat weight. Purchased the semi mount a long time ago. Added the color change Fluorite later on. The White Zircons are white, bright and sparkly. They look like diamonds. Genuine Earth mined White Zircon, not to be confused with Cubic Zirconia which is a man made stone. The color change on the Fluorite goes from a beautiful Cornflower Blue with hues of purple inside to an Aqua/Teal color. Very pretty and unique! 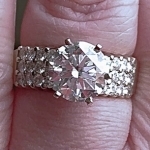 Excellent pre-owned condition with very light wear on the bottom of the band. Size 8, easily resized. Stamped 10K RJP inside the band. Selling to clear out jewelry box.